The exhibition For Now, presented by The As Long As It Lasts Collective, takes place in a former furniture shop, the RJ Home Collections. Past, present and future of this particular location are highly intertwined: currently vacant and waiting for a new, yet unknown purpose, the space is still carrying traces of its previous func- tion. As we do not know when the new tenant will start to make use of the venue, the duration of this exhibition is uncertain. 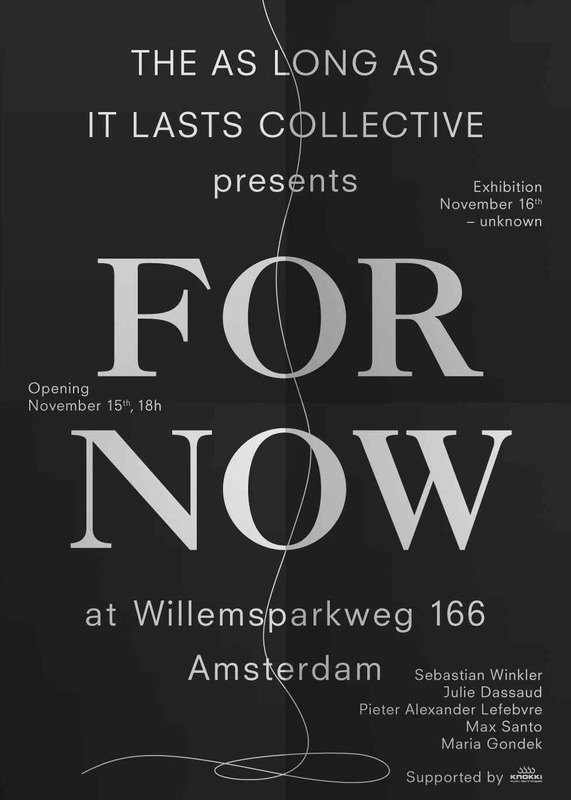 Starting from the transitional stage of the Willemsparkweg 166, we invited five international artists to reflect on the precarious, changeable and transitory nature of this space – some at close-range, some without ever having seen it. Max Santo’s Blaupause is a reference to the space from the distance. On the base of some photographs we sent him, he remade certain architectural details, e.g. the pattern of the basement’s tiles and some ornamental elements on the shop’s front side. Similar, yet not corresponding exactly to the actual features of the venue, Blaupause functions like an analogue, imprcise blue print. Santo, in this way, plays with his perception of the space from the distance and the actual physical condition of the venue. This results in subtle discrepancies. Found at 15.6.2013 hints at the peculiarity of this exhibition in a different way: made of chalk and exposed to influences that might change and even erase the work, the duration of the work is unpredictable. Sebastian Winkler’s works Das Garn #1, Das Garn #2, Das Garn #3 and Das Garn #4 are inspired by different sketches of weaving patterns found in weaving manuals. He translated those sketches into a colourful arrangement of cotton reels. The series, furthermore, alludes to the former use of the space: its basement contained a huge collection of fabrics that were used for the manufacturing of made-to-measure bolsters and blankets. Pieter Alexander Lefebvre designed his Round Table during his Master program “Vacant NL” at the Sandberg Institute. The table becomes a chair depending on the function it has to fulfil, and thus can never be a chair and table at the same time. Round Table, by means of his folding and multiple uses, focuses on economical solutions to make vacant venues (temporarily) usable again. Maria Gondek’s work Eternal Inflation can be seen as a reference to the precariousness of time that affects this exhibition. Three pipes suspended from the ceiling are filled with soap and water and connected to an air pump. The airflow creates a mass of tiny soap bubbles that slowly grow out of the pipes. The foam expands, grows in an endless variety of shapes and deflates, in a continuously changing process. Movement of people in the space and the opening and closing of the garden door subtly affects its shape and appearance. When the installation is turned off, the foam mass deconstructs and dissolves in the air. Julie Dassaud’s work In No Particular Disorder is composed of Situation study#4 (for slide projector, door & I/II players), Situation study#5 (for magic lanterns, RGB transparencies & slide projector), and Situation study #7 (for I/II players in the garden). Through light projections and different found materials in the Willemsparkweg 166, Dassaud intervenes in the space by creating subtle “landscapes” that play and change with the position and movement of the spectator. At the same time, those interventions deal with the physicality of the space as such. The work RJ’s Garden by Max Santo and Sebastian Winkler was developed spontaneously as a reaction to the space during the installation of the exhibition. They only used materials that were found in the space and in the garden. Karin Anzivino, Ferial Nadja Karrasch, and Arda van Tiggelen. Special thanks to Wieger Fransen (knokki.com) for making this exhibition possible and to Thilo Kasper (thilokasper.de) for the graphic design.